Sleaford Town endured a tough week with two heavy defeats in the United Counties League Premier. Jamie Shaw’s side were handed a 9-1 hiding at fourth-placed Wisbech Town last Tuesday, Andrew Chadwick grabbing Town’s goal three minutes before the break. Shaw had to rebuild a squad almost from scratch after becoming boss just days before the start of pre-season, and was able to strengthen last week. George Couzens and Connor Paine joined the club on loan before Josh Raby signed in time for Saturday’s home game with Daventry Town. All three were drafted in to the starting XI and Town had a chance to take the lead, but Couzens had his penalty saved. And Daventry led at the break through a penalty of their own. A poor goal just a minute into the second half gave Sleaford a mountain to climb, but they responded well when Curtis found the net with a powerful long-range effort. But Daventry landed a sucker-punch as Town pushed for an equaliser before a last-minute fourth completed a 4-1 defeat. The result leaves Town rooted to the bottom of the table and without a point after four games. They will look to put that right on Saturday when they travel to Leicestershire side St Andrews (ko 3pm) who have one point from three games. 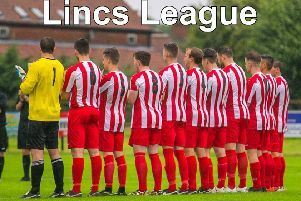 A league cup first round tie follows on Tuesday at Division One side Melton Town (ko 7.45pm).